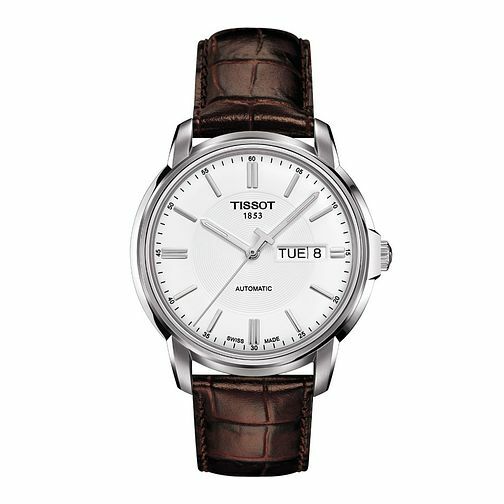 A stylish men's watch from Tissot featuring a brown leather strap and round white dial with a date function. Tissot men's stainless steel brown leather strap watch is rated 4.0 out of 5 by 4. Rated 4 out of 5 by Anonymous from Stylish and long lasting I bought this watch almost 4 years ago, and it is still in perfect working order and in good condition despite being worn every day. The leather strap understandably wore out after a couple of years, but I found it easy and relatively cheap (approx £30) to source a replacement one online and have it fitted. I don't feel any need to replace it anytime soon.